Mentioned in several posts, the yield curve, take importance in these weeks because it's reaching a flat level that had not since 2007, with possibilities to invest for 2019, this with clear damage to the stock market. Why? Let´s briefly explain you. Understanding how this curve is drawn, its types (normal-reverse-flat-humpback), its inclination (steep or flat) and its relationship with the market, will allow us to make better trades. Also knowing its basic principle: the direct influence of the short-term yield bonds is the i-rate assigned by the FED, while the long-term ones depend, also directly, on inflation and how it is eroding the value of the bonus in time. The yield curve is formed on an XY chart with the maturity times of the US Treasury Bond on one axis and the interest rates on the other. In an expansive cycle, there is a growing slope, as it is obvious that, at a longer time, higher yield is expected through a higher interest rate. 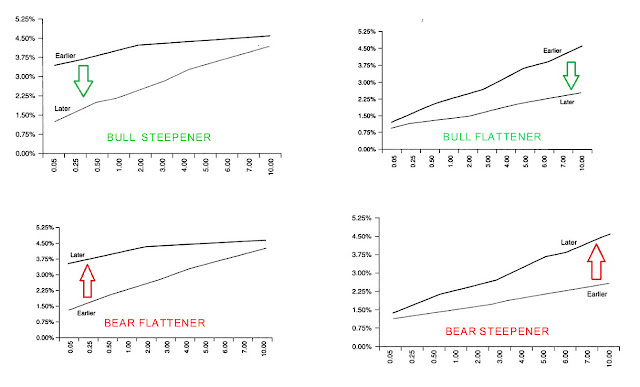 Flattening occurs when the differential or spread between the extremes approaches. On the stockcharts link: just choose a year in the SPX to see how the yield curve was that moment. 1. Bull steepener: occurred after the crisis in 2008 when the FED became dovish and in order to heat the economy, began to lower rates, so the short-term i-rate fell faster than the long-term. Notice that a bubble was created in the price of the short bonds, whose consequences are seen until today. 2. Bear steepener: it´s seen only the first months after Trump's victory, when an increase in inflation and FED Rate Hikes were foreseen. The steep slope was a sign of an expanding economy. 3. Bear flattener: occurs this year, when the FED adopts a more hawkish tone and short-term rates rise faster than long-term rates. The slow pace with which inflation advances flattens the curve, with the risk that it will reverse, which is a sign of the beginning of a recessive cycle. 4. Bull flattener: after a recession, reactivation is appreciated when the influence of inflation decreases in long-term rates and these fall faster than short-term ones. It is usually a good time to buy long-term bonds. Understanding the rate curve is decisive to invest taking advantage of the inflation and i-rate data. Check this didactic article by Felix Baruque for more information. The fact: a way to see graphically what can occur to economy, and therefore the stock market, is checking the differential between the bond rates. It is usually used as a spread data, the 2-year and 10-year bond yields, although other authors prefer to use the 3-month and 10-year bond. On this Bloomberg chart the spread is shown between the 2 and 10 year bonds since 1977. 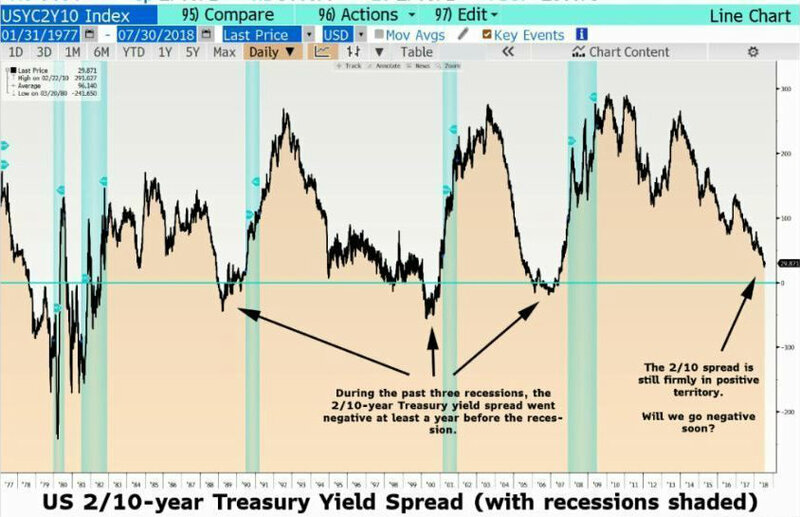 Look: whenever there was a recession cycle (in green) the spread became negative a few months earlier. Also Wall Street main banks, Citibank C, Bank of America BAC and JP Morgan JPM, had been having a tough year, this flat yield curve not benefit them, despite the tax reform and the 10-year Treasury Bond TNX near to the 3% rate, its higher since 2013 . The financial etf XLF also had a negative YTD. - The current flattening is due to successive FED Rate Hikes, in addition to the slow progress of inflation. - In the US more than 50 years ago, this behavior has meant the preamble of recession, which usually pulls down in the stock market. - There is almost consensus that two consecutive quarterly GDP decreases signals the start of a recessive cycle. - Today the jump in Average Hourly Earnings (2.9% vs 2.8% consensus) tell us a lot about how inflation and wages are moving, and fears of more Rate Hikes. From the point of view of the bonds, which always anticipate the stocks, it does not seem time to enter long on stocks, because the historical statistics shows that when the curve is reversed the recession begins, and that event is close to occur.So my best advice is to check the evolution of this spread in the next days and weeks. Swing trading, with risk management emphasis is, in my vision, the best option for the market today.